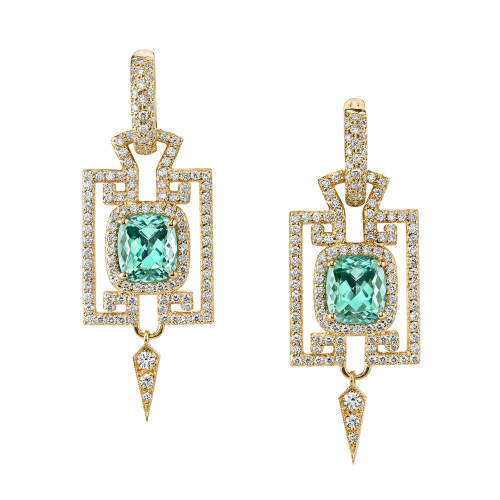 The Square Mint Tourmaline Earrings has an amazing design of Mint Tourmaline square centre piece surrounded by a cluster of Round Diamonds in a unique pattern. The Square Mint Tourmaline Earrings has an amazing design of 4.95 ct mint tourmaline square centre piece surrounded by a cluster of glittering 1.62 ct round diamonds in a unique pattern. The 18 kt Yellow Gold base holds the 0.75 ct diamonds in huggie in invisible setting.